Schedule tab: Contains new library ILL Schedule feature, in addition to enhanced ‘Out of Office’ date setting functionality. ILL schedule: Allows libraries to set standard days they provide ILL service (fill requests for other DOCLINE libraries). All DOCLINE libraries will initially be set to the default setting of providing service seven days a week. 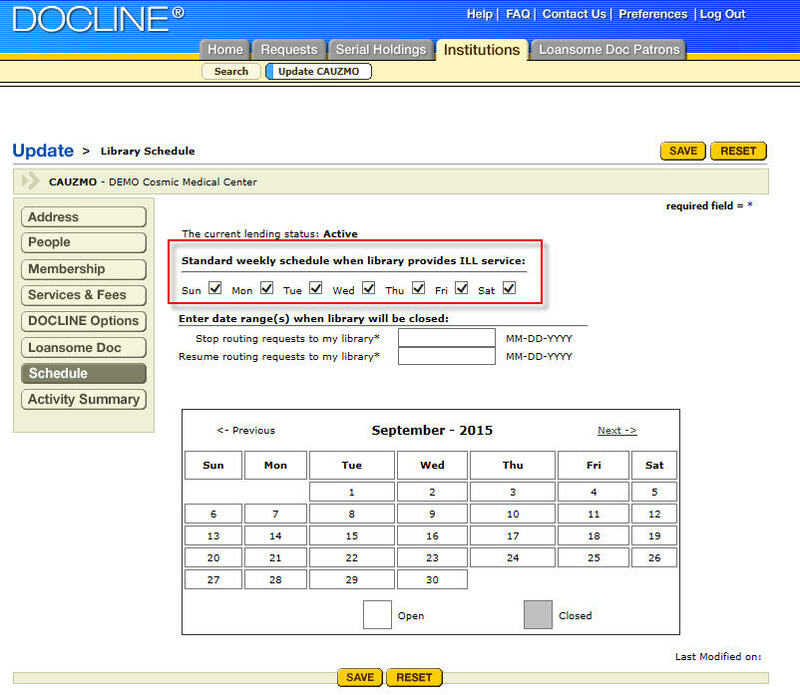 DOCLINE participants should update their library’s schedule to best reflect their regular availability to fill incoming Lend requests. The minimum level of ILL service is two days per week. Out of Office Dates: Out of Office Dates. Added ability to set multiple date ranges when library will be closed. Added calendar widget for choosing dates. Saved date ranges are displayed in a table. Added date validation prevents errors in re-activation dates caused by transposed years. Active/Inactive Calendar. Calendar shows dates library is open and closed. Reflects choices made in ILL Schedule, as well as Out of Office dates. Calendar display is limited to dates that are less than a year in the future. 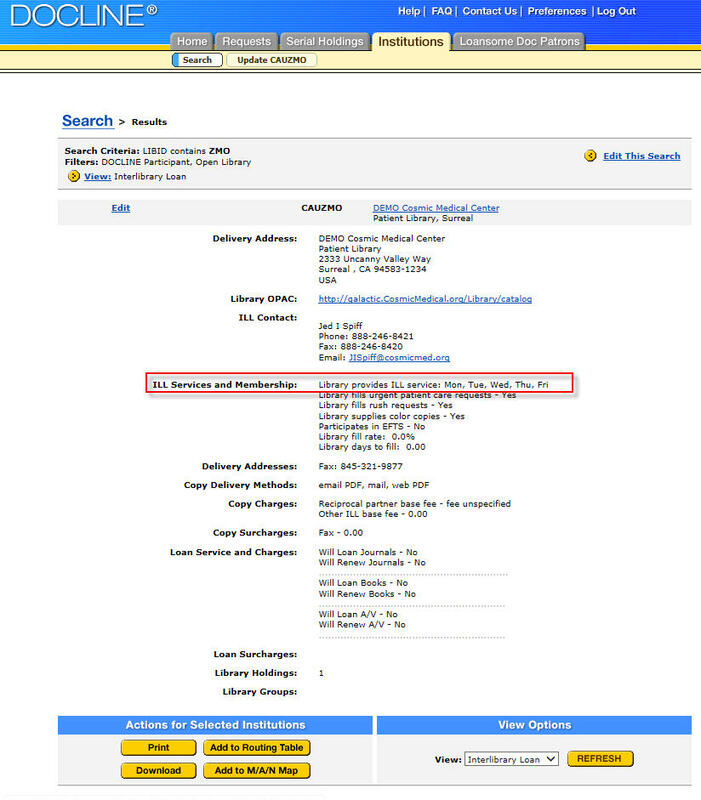 Filters for "Temporarily Inactive", "Days of Service", "Borrow Only Libraries". Days of service to the ILL Services and Membership area of the "ILL view". 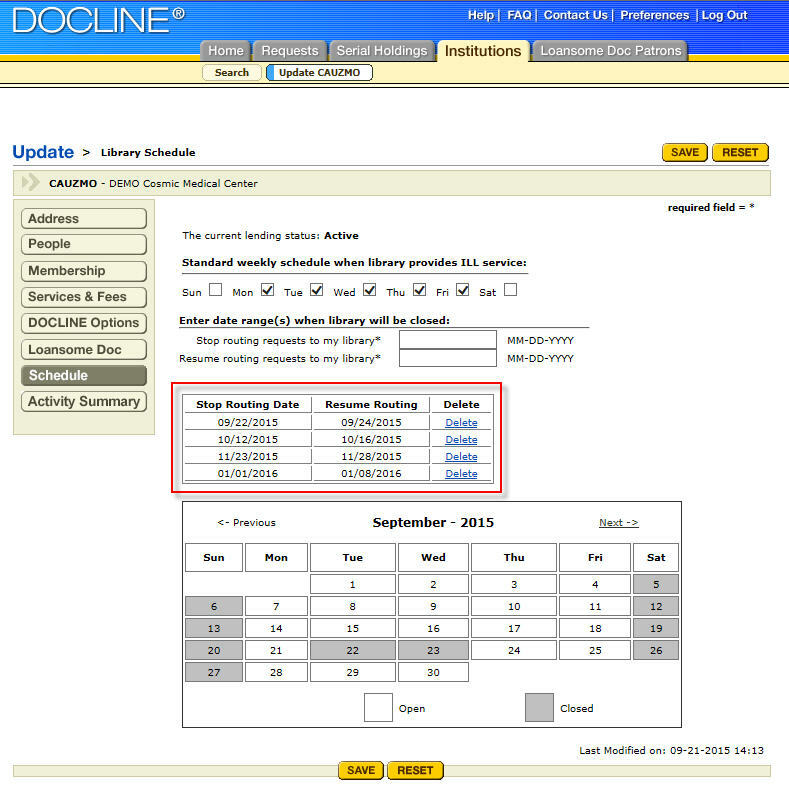 When there is no staff available to fill lend requests, due to vacations or similar outages, libraries can set themselves "Out of Office" in DOCLINE, which makes them "Temporarily Inactive" for lending, and prevents requests from routing to them. 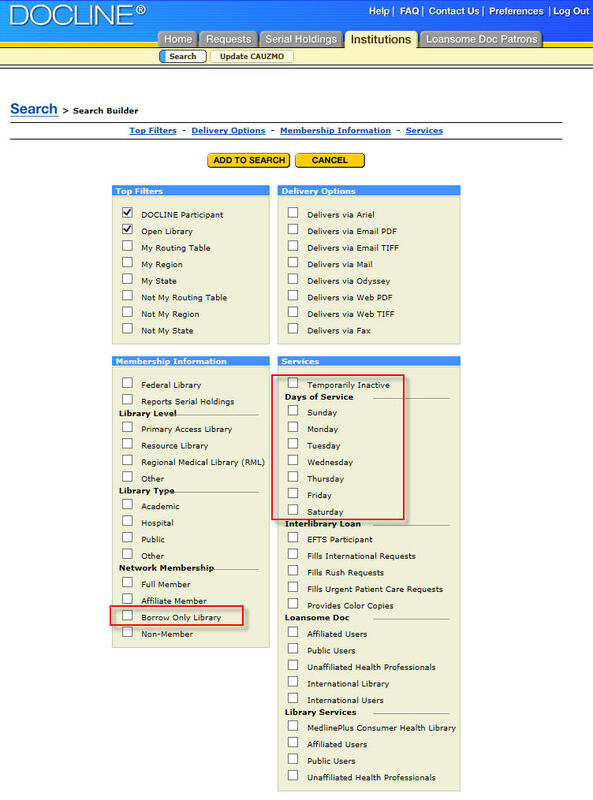 Select Update <LIBID> (your Library Identifier). 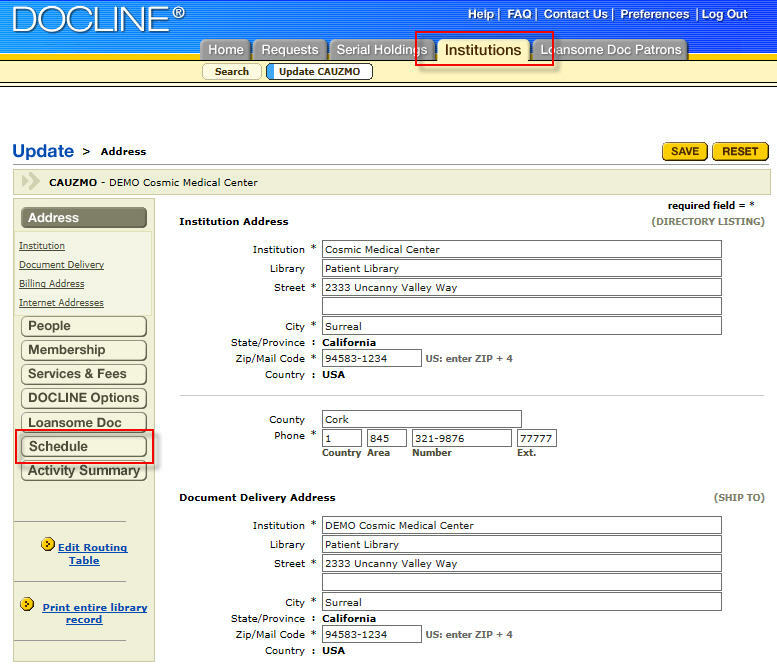 Select Schedule on the institution navigation bar. Under "Enter date range(s) when library will be closed" type or use the calendar to input the date when requests should stop routing to your library (MM-DD-YYYY format). 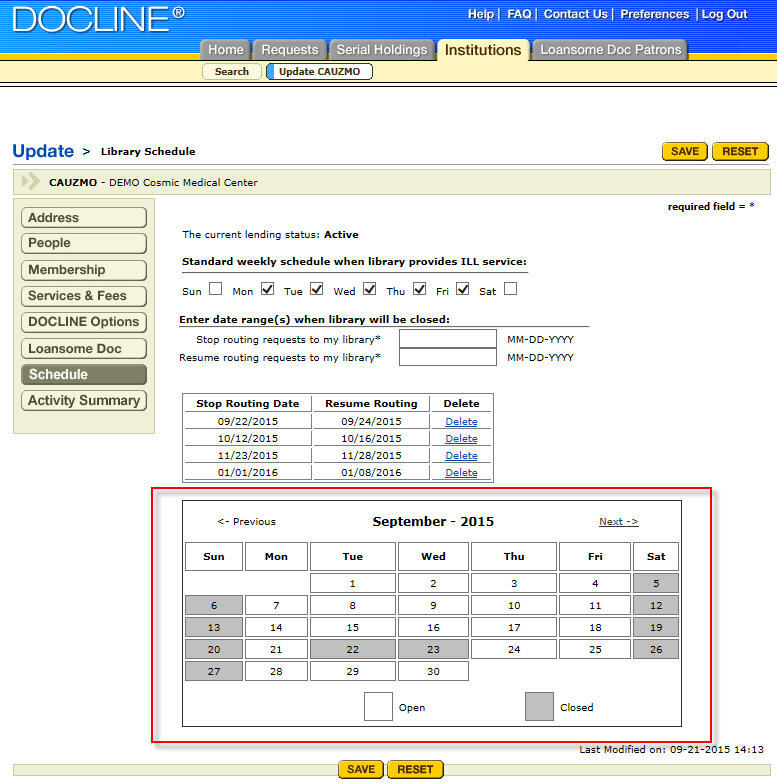 Enter the date when requests should resume routing to your library. At the end of the last active day, please receipt any new requests and update all pending requests as 'Not Filled' so they will immediately route on to the next potential lender.